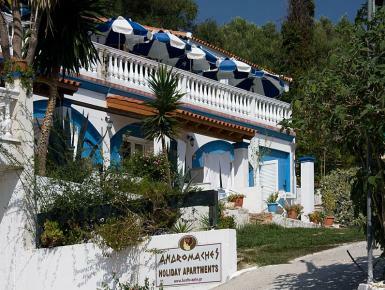 If you seek a distinctive place that embraces the romance, serenity and natural beauty for your holidays, should definitely be the Andromaches Holiday Apartments in Corfu (Kerkyra) island Greece. Located in a premium location in Achillion at Benitses village, our lovely hotel provides its guests with spacious, airy and shiny accommodations. Our guests, families, couples and singles return year after year to our hotel for recreation and rejuvenation while spending endless leisure time. For that reason, we constantly focus to offer a unique island experience to our guests so they can keep this memory forever. Front / Tour Desk services on 24/7 basis, ultra-clean swimming pool, wireless Internet Access and special facilities for children are just some of the comofort touches that make up our hotel.